ATLANTA, GA--(Marketwire - October 8, 2010) - Roark Capital, an Atlanta-based private equity firm, announced today that one of its portfolio companies, FOCUS Brands, has entered into a definitive agreement to acquire Auntie Anne's, the franchisor of the world's largest hand-rolled soft pretzel chain. Headquartered in Lancaster, Pa., Auntie Anne's has nearly 1,100 stores in 44 states and 21 countries. The transaction is expected to close later this fall. FOCUS Brands' subsidiaries are the franchisors and operators of more than 2,200 ice cream shoppes, bakeries, restaurants and cafes in the United States, the District of Columbia, Puerto Rico and 38 foreign countries under the brand names Carvel, Cinnabon, Schlotzsky's, Moe's Southwest Grill and Seattle's Best Coffee. With the addition of Auntie Anne's, FOCUS Brands will have six franchise brands generating more than $1.4 billion in annual system-wide revenues through more than 45,000 points of distribution in 47 states and 42 countries. "This world-renowned brand has been recognized repeatedly for offering a solid and rewarding business model for both their franchisees and their guests," says Russ Umphenour, CEO of FOCUS Brands. "Auntie Anne's commitment to excellence plays perfectly into FOCUS Brands' purpose to 'make people happy.'" Auntie Anne's President and Chief Operating Officer Bill Dunn adds, "Auntie Anne's prides itself on offering high-quality products, efficient operations and people-focused philosophies. FOCUS Brands' mission and vision complements Auntie Anne's 22-year-old founding principles, and we look forward to working together to grow our brand and continue offering the fresh pretzel products and signature beverages that our guests have come to know and love." Auntie Anne's represents Roark Capital's 19th franchise investment and 8th investment in the restaurant industry. Other Roark franchise companies include brands such as Batteries Plus, Fast Signs, McAlister's Deli, Money Mailer, Pet Valu, Primrose Schools and Wingstop. Neal Aronson, Managing Partner of Roark Capital, says, "Auntie Anne's is a wonderful company with a great history. We are pleased to bring together these two highly-respected franchise organizations." Roark Capital Group is an Atlanta-based private equity firm that specializes in business and consumer service companies with attractive growth prospects and revenues ranging from $20 million to $1billion. Roark focuses on middle-market investment opportunities through family-owned business transfers, management/corporate buyouts, recapitalizations, going-private transactions and corporate divestitures. Specific areas of focus include franchise, food and restaurants, marketing services, environmental services and business services. Roark has acquired 19 franchise/multi-unit brands that collectively have approximately 3,300 franchisees and $4.5 billion in system-wide revenues across 50 states and 43 countries. The firm has more than $1.5 billion of equity capital under management. For more information, please visit www.roarkcapital.com. FOCUS Brands' subsidiaries are the franchisors and operators of more than 2,200 ice cream shoppes, bakeries, restaurants and cafes under the brand names Carvel, Cinnabon, Schlotzsky's, Moe's Southwest Grill and Seattle's Best Coffee. Based in Atlanta, the primary objective of FOCUS Brands is to "FOCUS on making people happy." Please visit www.focusbrands.com to learn more. Auntie Anne's is the world's largest hand-rolled soft pretzels franchise known for mixing, twisting, and baking pretzel products to golden brown perfection in full view of customers. With a variety of snack and meal options for people on-the-go, Auntie Anne's offers a "Pretzel Perfect Guarantee" which simply states, "We guarantee you'll love your pretzel or we'll replace it with one that you do." Please visit http://www.auntieannes.com to learn more. 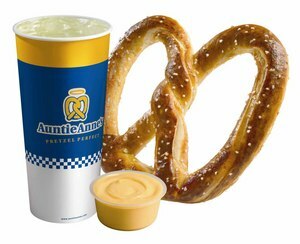 Auntie Anne's offers a variety of fresh, hand-rolled soft pretzel flavors, dipping sauces and signature lemonade products.